a very, very, simple web site, and uploading it to the server. and that you know your password. You must have a file called index.html as the home page of your web site. Any other files can be named anything else that you want. Note that index.htm is not the same as index.html, and capital letters are different than lower-case letters. You can see in the HTML that the image is referred to in the <img> tag as picture.jpg. 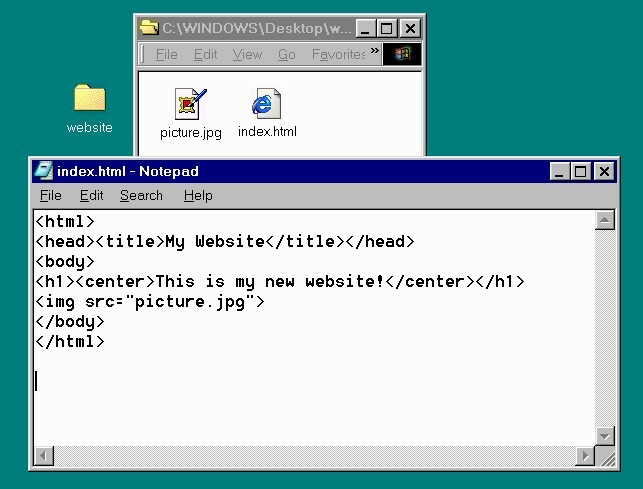 All of your images and links, in HTML, can be this simple. You don't need to specify the whole name of the server everytime you link to something. Some people like to put all of their pictures in an images subdirectory. This is fine, just remember, in your HTML, that the reference would then be "images/picture.jpg". 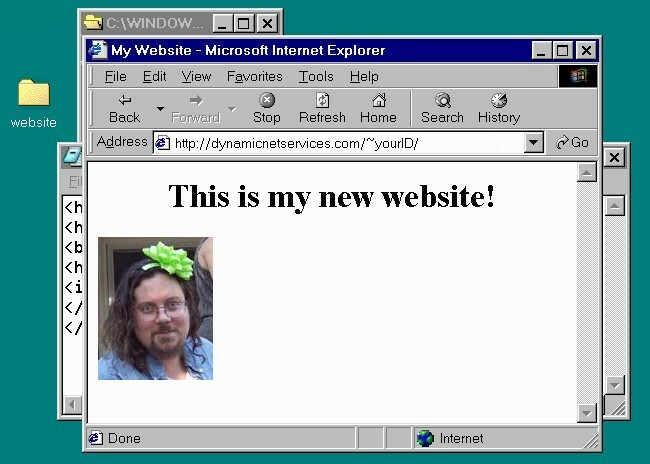 Next, start Internet Explorer. 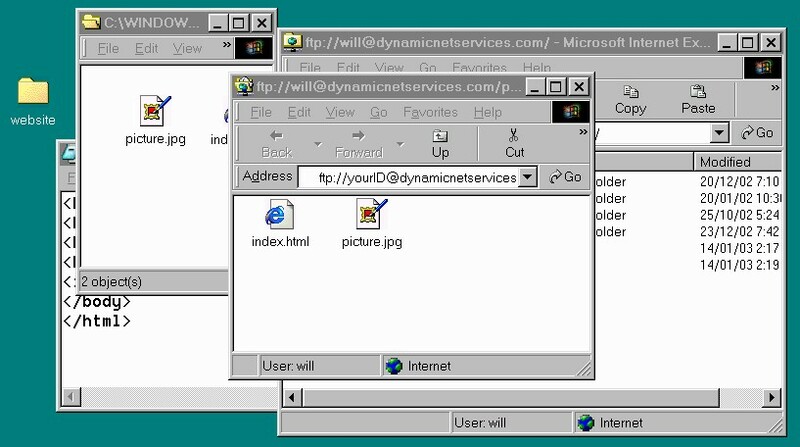 We are going to connect to the server using the FTP protocol. See the figure. 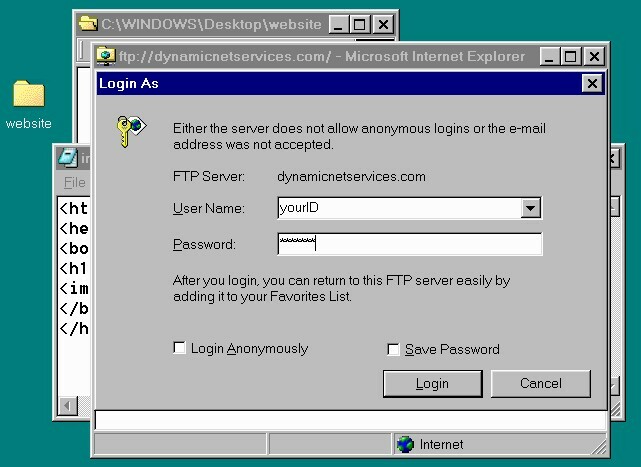 We've typed "ftp://dynamicnetservices.com" into the address bar. Press enter, and move on to step 3. 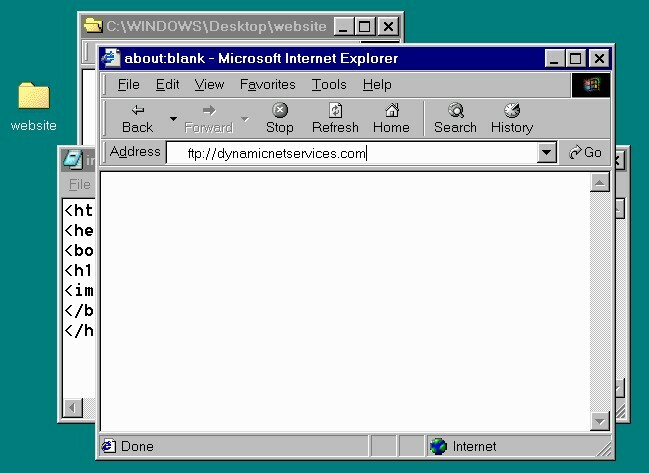 Internet Explorer needs to know your user ID and password before it can connect to the server. Enter them. Note that your password will look like "*****". That's so nobody else can see your password as you type it. Be sure to enter your user ID and password correctly. Capital versus lower-case letters are important! If you are having difficulty connecting, make sure you don't accidentally have the Caps-Lock key on while you type your user ID or password. When you are ready, click on the Login button at the bottom. At this point, if everything worked, you should see your public_html directory on the server as in the following figure. If you don't see the public_html directory, there must be something wrong. Did you enter the correct user ID and password? Did you type in everything exactly as it appears in Step 2? Go back and try again. 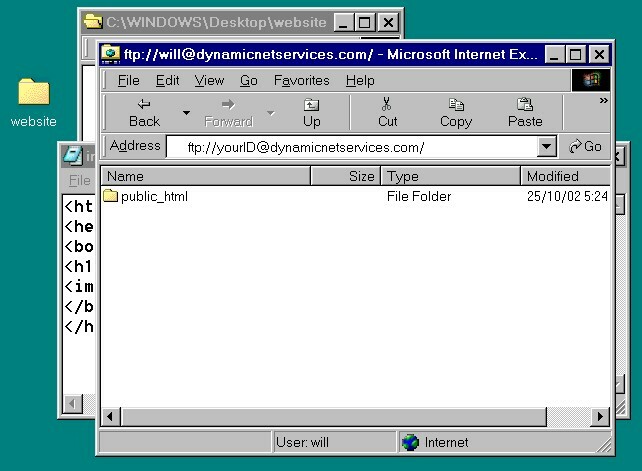 After you have double-clicked on the public_html directory, you should see a browser window showing the contents of the public_html directory. Double-check that all of your files are there. If you've missed some, transfer them now (just drag and drop them into the public_html directory). Step 7 - Checking, can you see your web site? You are done! 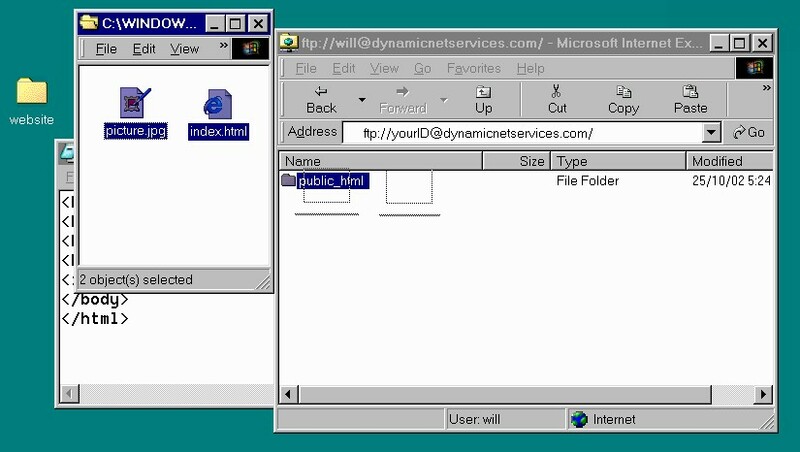 Just open a new Internet Explorer window, and type in "http://dynamicnetservices.com/~yourID" and you should see your web site! If anything is missing, go back to Step 5, and transfer the missing files.